«The idea for the book gave birth to many treasures, but the moment had matured for all this practical experience -having by now personally taught hundreds of freedivers how to freedive to 10, 20 and 30 meters- to finally turn into a written guide on the technique of freediving. If I felt as if I was missing something twenty years ago, by now I possessed it in abundance: it was the actual experience in the water with newcomers, people who did not even know what a wetsuit was, and in the span of one week to enable them to comfortably dive to 10 meters, while even commenting afterwards on how easy freediving was! 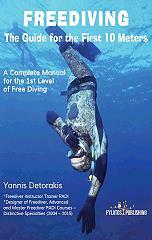 Yet freediving is of course far from easy. The satisfaction, however, of hearing them say it, is huge; when you have designed the training program and when you had been the trainer who managed to transform a person that until the previous day had not even once equalised pressure in his life, into an excellent freediver! As priceless is also the moment, familiar to every instructor, when your student succeeds on conquering a particular depth for the first time and surfaces with a genuine smile of deep joy and satisfaction on his accomplishment. This is ultimately the goal of this book: to accompany the new freediver into the sea and to help him, step by step, in building an excellent technique and achieving new goals in freediving, all the while giving him a smile of success!